Two Lanarkshire mills which were mothballed by Tata Steel have been officially handed over to new owner Liberty House. 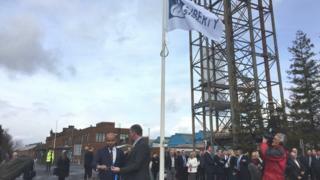 Liberty boss Sanjeev Gupta attended a ceremony at the Dalzell works in Motherwell. The Clydebridge and Dalzell steel processing mills were mothballed by India-based Tata three months ago. Liberty agreed last month to take on the plants in Motherwell and Cambuslang. Speaking after the handover ceremony, Mr Gupta said he hoped production could restart by the end of the third quarter this year. He told the BBC he expected 150 jobs to be created in getting both mills back up and running, with the possibility of further posts once production ramps up. A total of 270 people had been employed at the mills before Tata's decision to mothball them. Key workers were kept on standby at the plants so they could restart operations quickly after a period of inactivity. The move was backed by a support package from the Scottish government. Mr Gupta said he had been "very impressed" with the efforts of the Scottish government and the Scottish steel task force, which was set up to try to find a buyer for the plants. He said: "This is our first step in Scotland and I am very proud to come to Scotland. The Scottish people are very proud people, very hard working people. "Our group has many different divisions and many different businesses. We will explore every single one of them in Scotland and we are here now to stay. "The plate business in the UK is a great business, and it is a business which has eroded in the past. "We have lost market share, especially in the last few months since these plants closed, to imports and now we have a chance to get these plants back up and going and regain our market share." Mr Gupta added: "This is a conversion plant - you basically take steel slabs and convert them into plate. To do that competitively you need a few things. You need a skill set, which the plant has - it has an amazing workforce and amazing skill set - the plants are good and there is a market in the UK. "So the only thing which we need is competitive costs which have to be worked upon. What we need most critically is competitive raw material, which means steel slabs, and we know how to do that." In an unusual deal, the Scottish government took over the plants from Tata and immediately handed them on to Liberty House. It was claimed this was necessary to avoid delays, and there were assurances from ministers that taxpayers would be left with no new financial liability. The details of the deal are not expected to be completed until later this month. Scottish Business Minister Fergus Ewing said: "When we convened the Scottish steel task force back in October, we did so with a determination to do everything possible to secure a new operator and to do whatever we could to make the plants an attractive proposition. "Over the course of eight task force meetings and a lot of other engagement we made significant progress in five key areas to support the industry, namely business rates, energy costs, environmental issues, skills and procurement. "It has been a team effort which has paid off and once again the steelworkers of Scotland will produce world-class products from here in Lanarkshire."